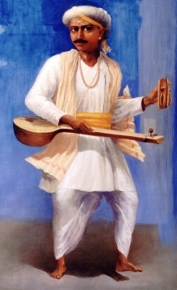 Tukaram, arguably the greatest poet in the Marathi language. Tukaram's genius partly lies in his ability to transform the external world into its spiritual analogue. Tukaram's stature in Marathi literature is comparable to that of Shakespeare in English or Goethe in German. He could be called the quintessential Marathi poet reflecting the genius or the language as well as its characteristic literary culture. There is no other Marathi writer who has so deeply and widely influenced Marathi literary culture since. Poetry as a genre is incomplete without Tukaram. Â© 2018 tukaram.com All rights reserved.